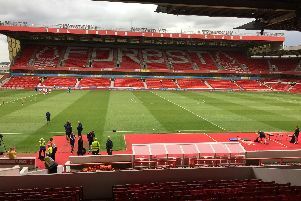 Nottingham Forest U18s were held to a 1-1 draw with Sheffield Wednesday following a last minute equaliser. Ethan Dekel-Daks put Forest ahead in the 53rd minute before Charles Hagan levelled in the 90th minute at the Forest Academy. The extreme weather conditions made life difficult for both sides throughout, meaning chances were limited at both ends of the pitch. Fin Back’s close-range header, which went straight into the arms of the Wednesday ‘keeper, was the closest they came in an uneventful first-half. But The Reds did take the lead early on after the break after some good work from Will Swan, who held the ball up well before teeing up Dekel-Daks who curled the ball into the net. Tawanda Mutoti then came on to replace Fin Back in the centre of midfield, moments before Josh Barnes was shown a yellow card for a late challenge. The visitors started to push for an equaliser, and they came close when substitute Liam Waldock rattled the bar with a powerful strike. Sam Greenwood was then shown a yellow card for kicking the ball away before Oliver Hammond came on to replace Alex Gibson-Hammond. Silvio Bello then replaced Greenwood on 90 minutes. But The Owls’ persistence paid off when a long ball over the top caught out the Forest defence, as Hagan brought down the ball well before knocking it past Michael Statham to take a point back to Sheffield.